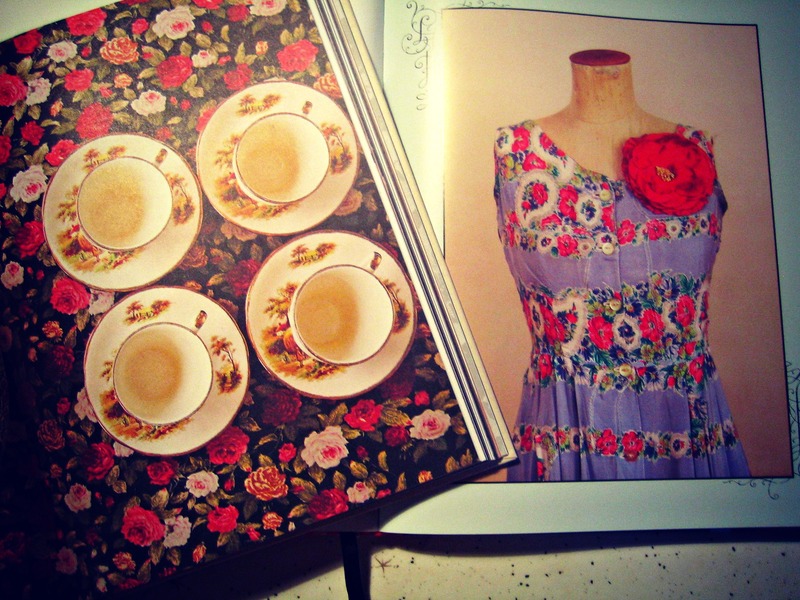 ‘Minxy Vintage: How to customise and wear vintage clothing’ by Kelly Doust (RRP $55) and ‘The A Vintage Tea Party Book: a complete guide to hosting your perfect tea party’ by Angel Adoree. (RRP $40). Australian Kelly Doust has written craft books before this one. You can read more about her HERE. Like her craft books, this book is squarely aimed at beginners. She writes a bit at the start of the book persuading the reader that vintage is worth shopping for and wearing, so if you are already a second-hand shopper…this stuff won’t be of much relevance. Seasoned ‘vintage’ shoppers will not learn much from this book, but it is worth a read for the ‘eye candy’ of the beautiful vintage dresses she has in her collection. Rather than being a ‘how to’ book, it’s more like a very detailed tour of Kelly Doust’s own vintage collection, with some commentary on how she mended or altered the items so that they met their potential. This part of the book was great for reminding me that it is worth buying things that need mending or altering, as sometimes I get into a phase of not wanting to buy things which need work. There are a lot of photographs of Kelly in the book – Kelly shopping, Kelly dancing, Kelly drinking tea, Kelly riding a scooter…. 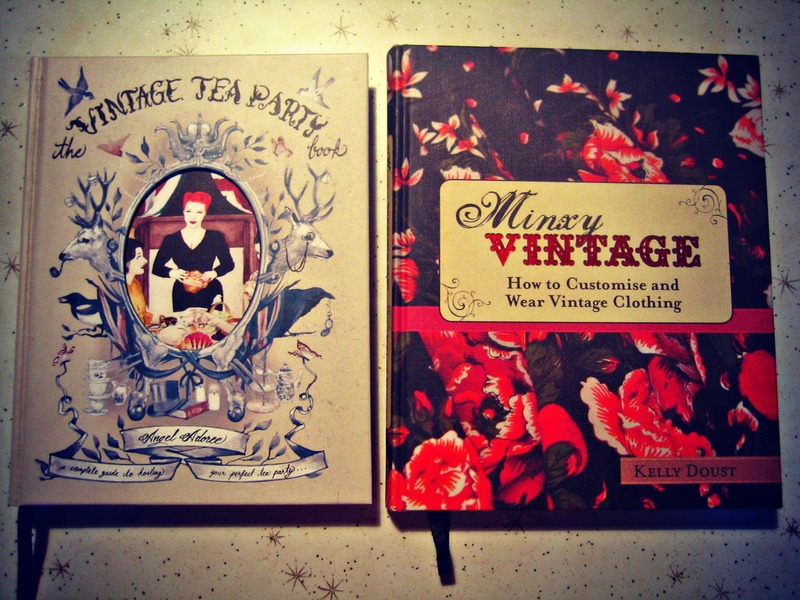 so the book about Kelly as much as about vintage clothing. Personally, I found this a little excessive. Kelly’s taste in vintage is all about elegance, glamour and there is a lot of formal/evening wear. My tastes in vintage are more earthy, punky/hippy and about comfortable day-wear, so while I really enjoyed reading this book and soaking in the beautiful photographs, it isn’t one I’ve added to my wish-list. If you love collecting and wearing glamourous 40s/50s/60s vintage, you will get more out of the book than I did, but it is a good ‘eye-candy’ read. Angel Adoree runs a Vintage Tea Party catering company in London. You can read more about her HERE. This is a beautifully designed and very fun book, featuring delightful photography, wonderful elaborate illustrations (like foxes in evening gowns!) and interactive things like a Queen Elizabeth stencil, and templates of invitations and thank-you notes for colour photocopying and many other craft projects, of varying degrees of silliness! She covers all elements of the perfect Vintage Tea Party from the china and table settings, to personal vintage style (how to do victory rolls in your hair, vintage clothing and make-up, men’s grooming, and there are patterns for vintagey aprons!). The photographs of vintage china and ephemera are simply stunning. This book is so much fun! I would probably not cook from it, but I really enjoyed reading it and it is very inspiring. As you read, you get deeply immersed in Angel’s world of high-camp fantasy…and it is a colourful and happy place to be! Fantastic to read honest reviews of these, I’ve eyed both of them up recently!